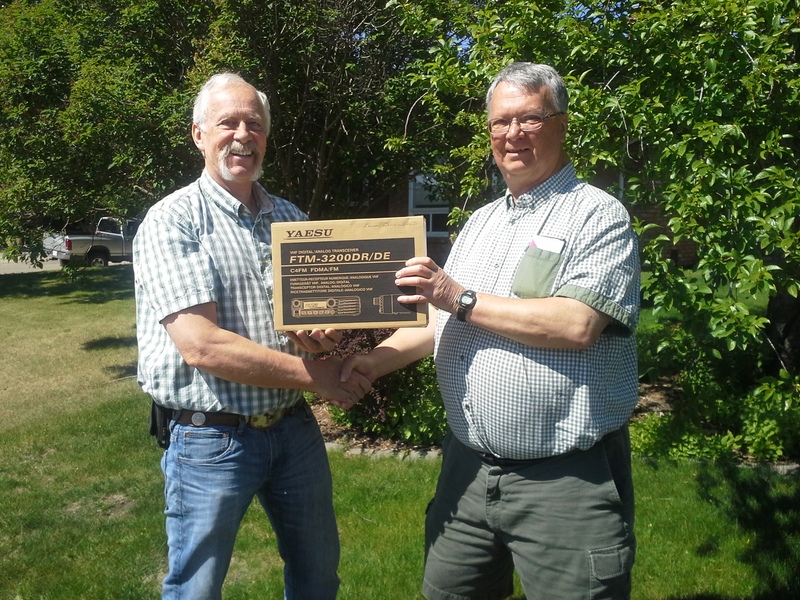 Congratulations to Brad VA6BMK, winner of the $500 raffle draw and Brian VE6CKC winner of the $200 raffle draw at the 46th Annual Red Deer Picnic June 19, 2016. 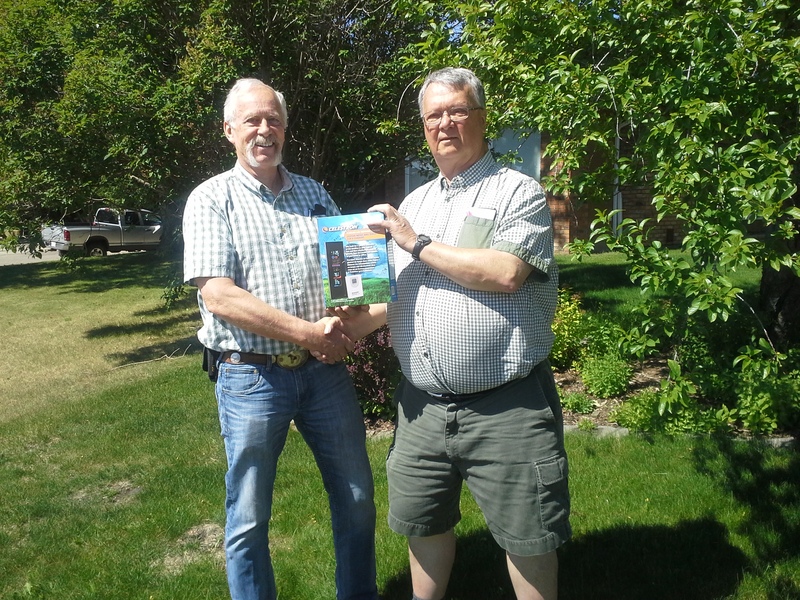 Pictured here (right) John VA6SJA receives from Garry VE6CIA the Yaesu FTM 3200DR and the Celestron weather station draw prizes donated by Radio World Central which he won from the main draw and the Canwarn training draw. 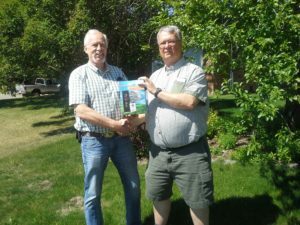 Other prize winners include: Eric VE6HFF winner of an FTM 3100R donated by CAARC, Darren VA6WNG winner of an FTM 3100R donated by VE6HPY and VE6CIA, Rick VE6RAK winner of a Sangean Weather Alert Radio donated by Radio World Central, Pericles VA6PTA winner of the Raspberry PI2 donated by KoHen, and many others too numerous to mention. Some of the ladies: Sheila (xyl of VE6HFF), Linda (xyl of VE6DE) and Brenda (xyl of VE6BLL) won the 2 beautiful hooked wall art and knitted blanket created and donated by Sylvia VE6SYL. Special thanks go out to Greg VA6GMC and Karen VE6LDY for the super tasty pig and all the hard work that comes with preparing, cooking and presenting the wonderful pork that was on our plates. Also thanks to all the other donors of the wonderful food at the pot luck. Chalk up another successful Ham Radio Pignic thanks to all of you that participated and made it all worth while. Radio Amateurs of Canada (RAC) becomes an integral part of Amateur Radio culture; when a new Ham obtains his/her certification, they rush to join RAC and enjoy the benefits of the organization which is recognized both nationally and internationally as the voice of Amateur Radio in Canada. If it is an Amateur Radio question, concern or issue. RAC is the organization that addresses those concerns and supplies the answers and guidance. We attain high service levels; we meet the needs of our members and serve as an example to other international Amateur Radio organizations on how to service their constituents. Director, Executive and Assistant Director positions are coveted by RAC members, who are equitably represented by their elected officials. The annual convention is well attended and through technology, is made available to a wider range of members who cannot attend in person. RAC pushes communications to their members, through a variety of methods. Ham nets, local club communications, face-to-face meetings, presentations, newsletters. The Canadian Amateur magazine, social networks and e-mail/web bulletins are among the devices employed. We achieve a level of communication with the public, and the various levels of government that truly reflects our capabilities and the extent to which we can contribute to both emergency communications and public awareness of the abilities of our hobby. RAC promotes education and “elmering” to new Hams, and supports the training and coaching of RAC volunteers to achieve exemplary results, at the municipal, provincial and national levels. The new RAC Field Training program is the recognized tool leveraged by our ARES groups (emphasis added). Our volunteers are the lifeblood of our organization, and we develop an appreciation program that reflects our reliance on their abilities and commitment. All RAC members recognize and appreciate what the individual volunteers contribute, and the value that RAC, as an organization, brings to Amateur Radio in Canada. RAC achieves a stable financial position, with a positive, growing membership which truly reflects the outstanding representation that RAC makes to Industry Canada and the world of Amateur Radio in Canada.